Polarization of the Cosmic Microwave Background. Colors indicate warmer (red) and cooler (blue) spots. The white bars show the polarization direction of the oldest light. Much of what we know about the origin and early history of the universe comes from a phenomenon discovered by accident 50 years ago: The cosmic microwave background (CMB). This very faint radiation, left over from a time – about 400,000 years after the Big Bang – when enough neutral atoms had formed to let light travel freely, is the closest thing science has to a panoramic snapshot of the contents of the cosmos as it was taking shape. "The physics of the CMB is deep. 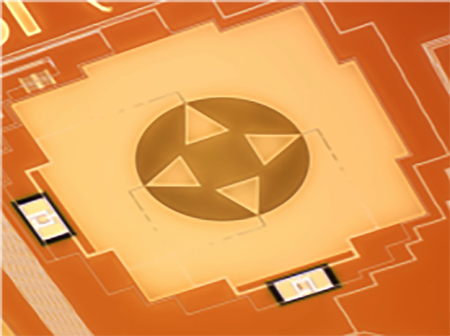 There is so much to be learned from it," says Johannes Hubmayr of NIST's Quantum Devices Group, who with colleagues has devised a new kind of CMB sensor array that features very sensitive detection elements that can measure two spectral bands simultaneously. The intensity of the CMB is extremely uniform, varying only by 1 part in 100,000 from place to place. But scientists can extract information from those minuscule variations about density differences and energy distribution in the early universe. This anisotropy has been intensively mapped and studied over the past quarter-century by scientists around the world, and it is still yielding insights. But another property of CMB photons – their polarization – was first observed much more recently. Variations in polarity reveal other, complementary aspects of cosmic evolution. Part of a NIST detector array for the ACT. Each pixel is 7 mm in diameter, containing an antenna and 4 TES bolometers: 2 frequencies and 2 polarizations per frequency. "The intensity anisotropy largely shaped our current `standard model' of cosmology, and constrained the six numbers that parameterize this model, such as the age of the universe and the average density of matter that fills space," says Hubmayr. "However, cosmologists know this model is incomplete. Polarization measurements will allow scientists to go beyond this standard model and describe physical processes that happened a trillionth of a trillionth of a trillionth of a second after the Big Bang." Those measurements have been actively pursued at multiple sites around the world for about 15 years. Landmark observations were recorded by the Wilkinson Microwave Anisotropy Probe (WMAP), a NASA Explorer satellite mission that flew from 2001 to 2010, and by the European Space Agency's Planck satellite, launched in 2009 and still orbiting the Earth. At the same time, numerous ground-based telescopes at the South Pole, arid elevations in South America, and elsewhere have made key measurements. NIST has provided detectors for many of them. Variations in polarization carry information about density fluctuations, gravitational lensing that occurs when light is bent by the matter between us and the CMB surface, and potentially gravity waves emitted at extremely early times. "Scientists are anxious to push the limits of CMB measurement because of the wealth of information that can be gained," Hubmayr says. "But there is a catch: the measurements are exceedingly challenging. The signal is very small, and there are other astrophysical sources – from our own galaxy for example – that obscure this pure signal. " Enlarged view of a single pixel. The CMB is a thermal signal, peaking at 160 GHz with wavelengths in the millimeter range. Conventional sensors that can detect polarization in only a single frequency band (centered on, for example, 90 or 150 GHz) can have trouble discriminating the CMB from other astrophysical sources. But the new NIST detector design is not only more sensitive, but also "multi-chroic" − that is, it can measure the properties of photons at two different frequencies at the same time in the same pixel. "This technical innovation increases the detection sensitivity while also provides an entirely new, second frequency band that can be used to discriminate the CMB from other astrophysical sources," Hubmayr says. "Frequency coverage has recently emerged as a key requirement of next-generation microwave background imagers, and multi-chroic detectors deliver this requirement without adding to costly focal plane area. " To detect and measure the polarization of CMB photons, researchers use quantum-based devices called transition-edge sensors (TES). Each contains a tiny superconducting circuit cooled until it is right at the "edge" of the critical temperature that marks the transition between superconducting and normal conductivity. In that condition, the TES is exquisitely sensitive to even tiny amounts of added heat energy. As photons arrive at the telescope, they are channeled by tapered cylinders onto an antenna on the surface of the chip, which contains the four TES bolometers. * The antennas are polarization-sensitive, and transfer the energy from photons of different polarizations and different frequencies to different TES bolometers. That, in turn, changes the electrical resistance. 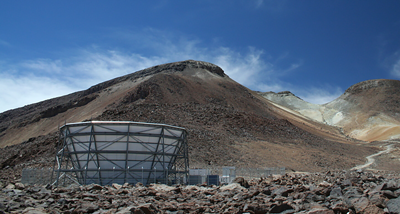 Earlier this year, collaborators from Princeton, University of Pennsylvania, Cornell, University of Michigan, and other institutions installed the first suite of the new detectors on the Atacama Cosmology Telescope, 17,000 feet up in the Chilean high desert. 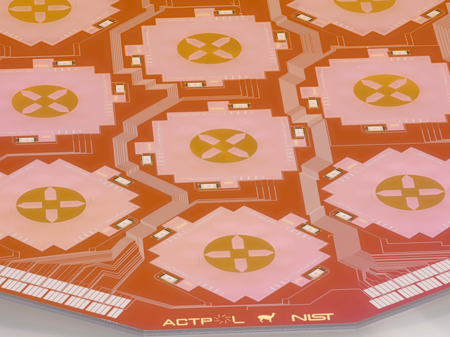 "This array is the first of its kind," Hubmayr says. "Initial data show that the array is performing remarkably well, which is really exciting for us. Observations will continue throughout this season, and the resulting dataset, with the added frequency content, will provide new insights about the universe and fundamental physics." The NIST scientists expect the new sensor arrays to expand the range of insights that can be extracted from the CMB. One involves the sum of the masses of all the cosmic neutrinos that incessantly stream through space. Neutrinos are near-massless particles that barely interact with ordinary matter. Cosmic neutrinos are relics of the early universe; they decoupled from the primordial plasma a few seconds after the Big Bang. Their total mass affects the growth of structure, which is probed via CMB polarization. "The CMB will provide an alternative means to measure the neutrino mass sum. This alone will have a large impact on high-energy physics," Hubmayr says. "However, and I find this the most compelling, CMB polarization measurements may provide – for the first time- a quantum probe of gravity. That would be ground-breaking physics. For that to happen, nature must be kind, and place the amplitude of the signal at a level that is detectable by our instruments. As metrologists, it is our job to push the limits of the technology to make these kinds of measurements a possibility." * A bolometer is a device that measures the power of incident light by detecting the amount of heat it generates in a material whose electrical resistance is dependent on temperature.